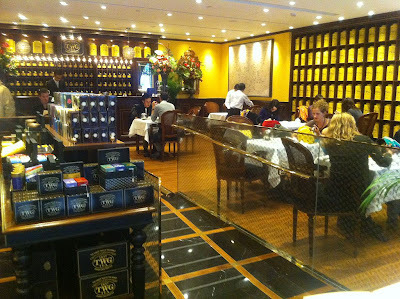 TWG opened three months ago at the IFC, after mall management kicked out Pacific Coffee to make room for the high brow Singaporean tea company. Since then, a day hasn’t gone by without a line forming outside the restaurant and blocking pedestrian traffic. Afternoon tea starts at 3pm every day and I showed up 15 minutes early to secure a table. There were two sets to choose from: “chic” and “fortune,” each cost roughly $250. My friend and I ordered one of each for variety and we had a choice of scone or cake. Remembering how Oscar Wilde famously declared in his comedic play The Importance of Being Earnest that “cakes are rarely seen in the best houses nowadays,” I naturally went with the scone. My less fashionable friend opted for cake and he walked to the pastry counter where a half dozen selections were on display. He pointed at one of them and asked the waitress what it was. She answered, “I don’t know, let’s skip that one.” It was an ominous start. 10 minutes later, the food and tea arrived. On the lonely two-tier rack sat my scone and jam. Next to it was a green salad and two sandwich wedges. The scone was hard and cold, and the sandwich was stale. I realized I had just spent $250 on cafeteria food. And the tea was equally disappointing, hardly “the finest in the world.” In honor of the recent British royal wedding, I picked the “Grand Wedding” blend but the taste was indistinguishable from a supermarket tea bag. The tea itself was lukewarm and so the sugar wouldn’t dissolve. And when I asked for a refill – a standard request at afternoon tea – the waitress said, “Sorry, we don’t put tea leaves in the pot and so we can’t give you more tea. I can either bring you a glass of water or you can pay for another order of tea.” It was official: I had been duped! But the nightmare continued. Perhaps because the restaurant was understaffed, our waiter plunked our orders down on the table and immediately walked away without a word about what any of the food was. A minute later, a different waiter brought us a plate of smoked salmon sandwich and left. Just when I was about to take a bite, he ran back to our table and said “oh, that’s not yours!” before taking it away. 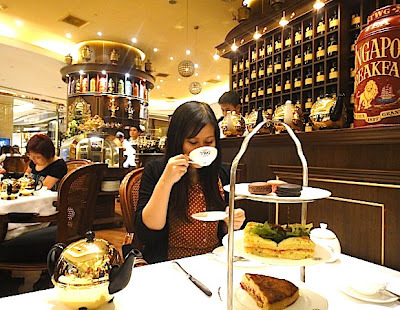 TWG Tea Room is a complete disaster. The wait is long (which probably won’t last once its bad rap gets around), the food is bad and overpriced, and the service is atrocious. After my unfortunate experience, I talked to a few people who had eaten there and the bad review was unanimous. Unless and until management wakes up and makes some fundamental changes, the restaurant is doomed to fail. In the meantime, if you desire proper afternoon tea, have it at the Four Seasons Lounge a short walk away. TWG was a bit too posh and "open" in the mall for my liking, if they want to make it a high end place I would have thought they shouldn't just walled the place up in glass so everyone outside is poring over what you are eating or drinking. But I have to admit I have bought a few whole cakes there for folks and friends and all vowed to it that they are jolly good. But I found the service slightly apalling. The few waiters there don't really know what they are selling and had to check with the chefs or whoever every time I asked and certainly weren't the most friendly nor helpful nor pro-active bunch in Central. Not to mention being slow despite my telling them I was in a great hurry. I happened to walk right past yesterday and had some time to kill. And for the first time since it opened it had no queue whatsoever outside (on the second day of the lunar new year ???) and I thought I'd go in just for a cuppa and chase up on a bit of reading and writing before meeting up with friends. The tea I had was very nice, admittedly, to my surprise, and they do have a big selection there. The macaroons delicious (though the texture could be better). I had a small size of lemon flan or tart or something and nice though it was, it was a bit too sweet. I thoroughly enjoyed your rather critical review! It's great to have a food blog that doesn't just gush about how amazing every single restaurant is. I find every western restaurant in central Hk has the same 'winning' formulae: expensive food + poor execution + bad ingredients. I have to admit their truffle scrambled eggs are not bad though! The only good thing on the menu and I like their packaging and branding, which still doesn't excuse the poor service and the quality of the rest of the food. Sounds like you had a better experience than I did, Christine, at least vis-a-vis the tea and macaroons! I agree that the packaging is enticing, but the merchandise are way overpriced. HKD600 for a tin can of tea leaves? Even the "Queen's tea" Fortnam & Mason charges less. Why look for overseas imports when we have Lok Sha tea house on our own doorstep. They have genuine experts who know their products (only once in my life have I been advised as to what the perfect temperature for a particular blend of tea is) and their vegetarian dim-sum is very tasty too. Have you been to Amuse Bouche yet? Curious to hear what you made of it (apologies if I missed one of your earlier postings). I hated the restaurant. The tea was terrible and the pastry very bad. 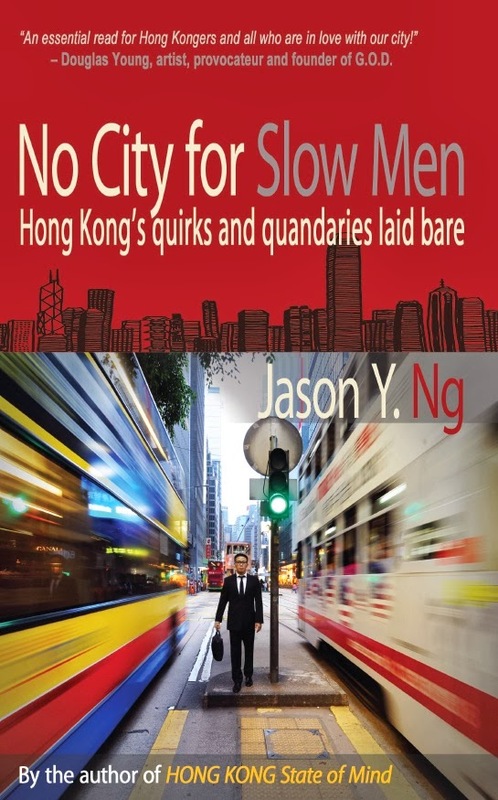 Jason, I couldn't agree with you more on TWG Tea Room. 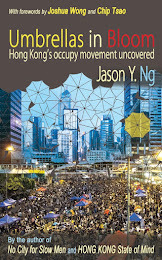 Anonymous, where's Lok Sha Tea House? Do you mean Luk Yu? This review is right on! I recently had a very similar experience, but instead of bringing the wrong food order, my friend's Wagyu Burger contained a very long strand of woman's hair (and my friend's a guy). After we mentioned this to the staff, they acted very annoyed and didn't want to deal with the problem. Needless to say, we will not be coming back here anytime soon. Last weekend, I read a review of this place in the SCMP paper where the owner and the Marketing Manager of TWG was boasting how great of service and food they have brought and introduced to HK. What a lie! I would say people of HK is much better off not having this kind of tea-place with such bad service and over priced food. For good quality high-tea experience, I would stick to the regular hotel places - Mandarin Oriental, 4 Seasons, and even Cafe Gray. Apologies Lok Cha. If you haven't been I would recommend. List of Chinese teas is very impressive and certain (not all) of the waiters are true aficionados who really know their stuff. Ok, I admit might seem a bit touristy but I like the place, it is intimate and the staff are very friendly. HC and JL, it looks like I am not the only harsh one! Hair in burger, AB? Your experience was worse than mine! Thanks for the link, Anonymous. 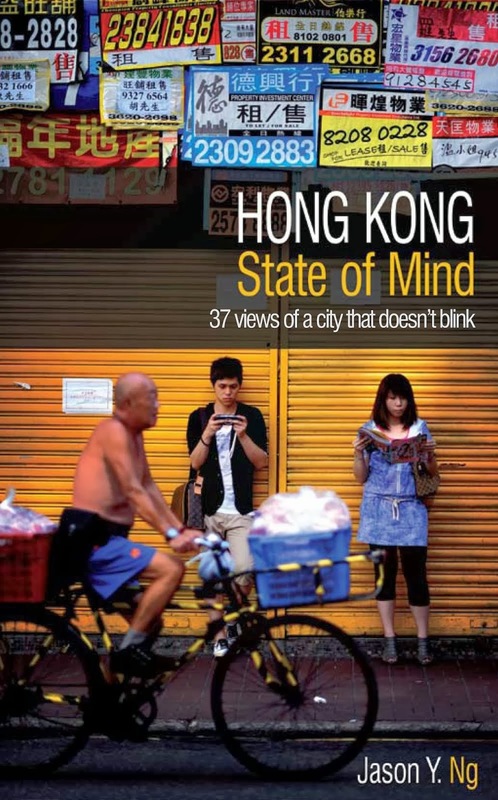 It looks like Lock Cha is in Sheung Wan. I will give it a try some day. After a bad experience with TWG I made a little google research and found your post. I totally agree with your coments. I also find very suspicious resemblence to famous (and excellent) tea house mariage freres (www.mariagefreres.com). Check it out and judge for yourself. Thanks, Anonymous. And thanks to Google!! I'm familiar with Mariage Freres -- Lane Crawford started carrying their tea products several years ago. MF is in a whole different league compared to TWG. It would be like comparing Hermes to G2000, if you know what I mean... Fortnam & Mason would be a more worthy adversary. There are MF restaurants/tea rooms in France and Japan, though I haven't yet tried any of them. But I'm sure they are a million times better than TWG. They have to. 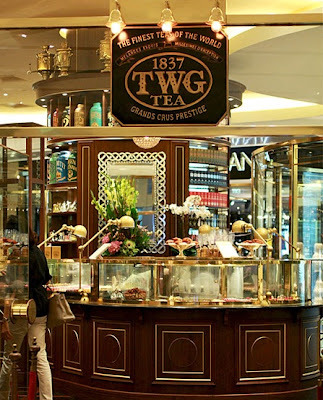 TWG is familiar to Mariage Freres because one of the owners worked there for 15 years before starting TWG! After reviewing all the negative comments, I bought (and will keep buying) their tea leaves instead. They are excellent! !